These dairy-free flapjacks are the perfect breakfast treat! In a large mixing bowl, sift the cake flour, baking powder and salt together. Set aside until needed. Use a free-standing mixer or an electric hand-held beater and whisk the eggs and sugar until light and fluffy. Fold in the melted coconut oil and sifted ingredients. Add the coconut milk and stir until combined. Heat the oil in a large frying pan over low heat. Drop spoonfuls of batter into the pan and fry until the tops start to bubble. Flip the flapjack and fry until cooked through, about 2 minutes per side. Repeat with the remaining batter, stacking the flapjacks on a serving plate as you go. 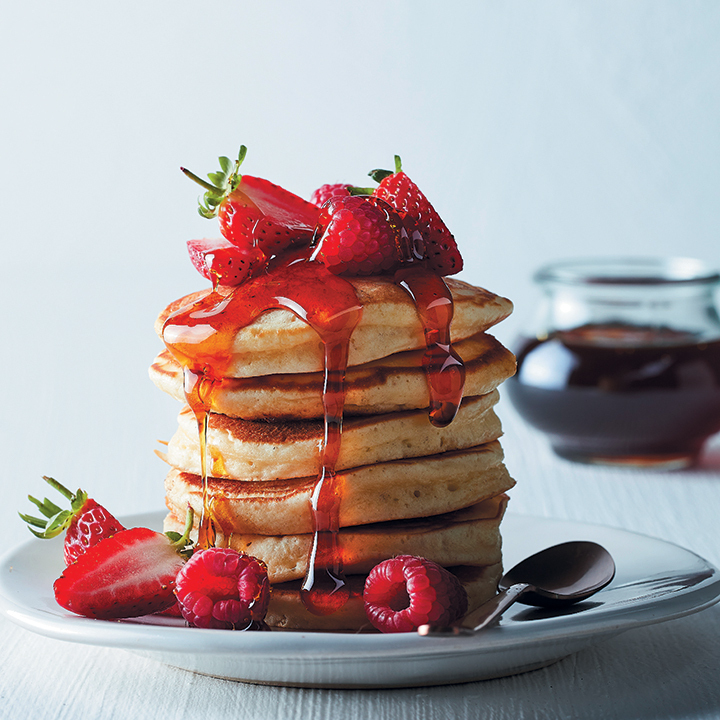 Top with fresh seasonal fruit and drizzle with maple syrup. Serve immediately.